Notwithstanding the long-held belief that Machado sought to at best to camouflage and at worst deny being a mulatto, I contend that his primary motivation was to achieve a sense of racelessness. He endeavored to go beyond the physical limitations of being a mulatto to become a "meta-mulatto," that is, a mulatto whose writing grappled with the universal questions of duality and ambiguity in all human existence-miscegenation in a higher sense. He displayed what has been termed "mestizo consciousness," "radical mestizaje," and "critical hybridity" (Anzald�a 1987, 77; Ramirez 1983, 6; Sandoval 2000, 72; Daniel 2005, 264; Lund 2006, 55) by affirming a mulatto identity grounded in a more inclusive or universal self, beyond questions of racial, cultural, or any other specificity.� As a multiracial individual of African and European descent in a society that prized whiteness and stigmatized blackness, Machado viewed the challenge of achieving upward mobility and public success without also compromising his personal integrity as merely one of the myriad epiphenomena of universal duality and ambiguity. G. Reginald Daniel, Machado de Assis: Multiracial Identity and the Brazilian Novelist, (University Park, Pennsylvania: The Pennsylvania State University Press, 2012): 120-121. 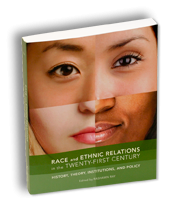 A collection of new essays, written by a team of interdisciplinary authors, that gives a comprehensive introduction to race and ethnicity. 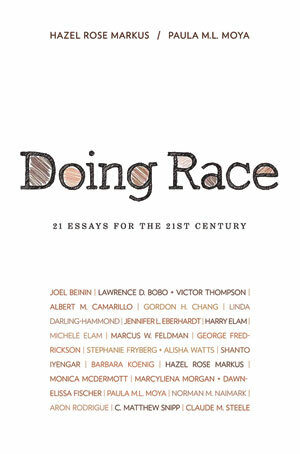 In Doing Race, scholars from across the disciplines have written original essays on race and ethnicity aimed at an undergraduate audience. The book provides a practical response to the view, common in American debates, that race and ethnicity no longer matter, or that race and ethnicity should not be taken into account when deciding how to structure society and formulate public policy. It also answers the question of why race and ethnicity play such a large role in fueling violence around the globe. Doing Race shows that race and ethnicity matter because they are important resources in answering the fundamental, even universal “Who am I?” and “Who are we?” questions. It demonstrates how understanding how identities are shaped by race and ethnicity is central to understanding individual and collective behavior in the United States and throughout the world. Drawing on the latest science and scholarship, these original essays provide undergraduates with an effective framework for understanding the persistence of racial inequalities and problems in the 21st century.